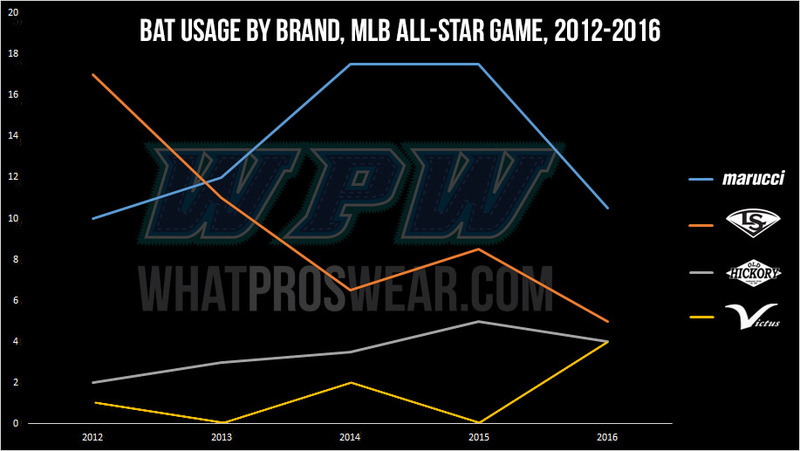 Today we present to you the findings of our 5th season tracking bat usage in the MLB All Star Game. 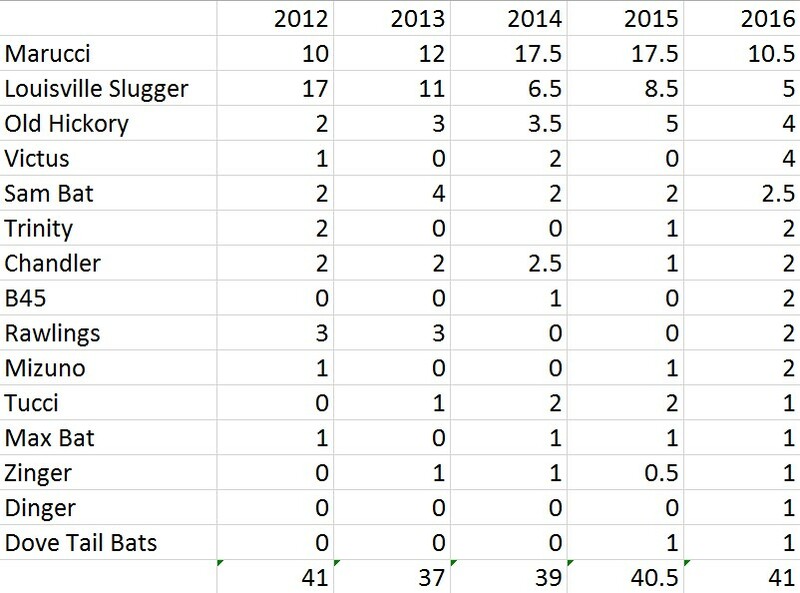 Since 2012 when WPW was founded, we’ve tracked the game’s bat usage as an unofficial barometer of the pro wood bat industry. 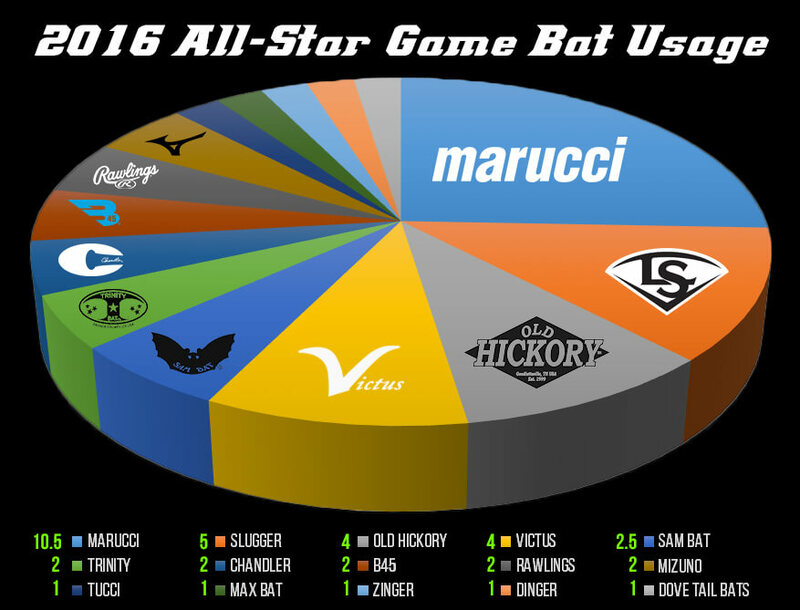 Correction: For the first time ever, Victus cracks the top 3, joining Marucci, Louisville Slugger, and Old Hickory as the top brands in 2016. 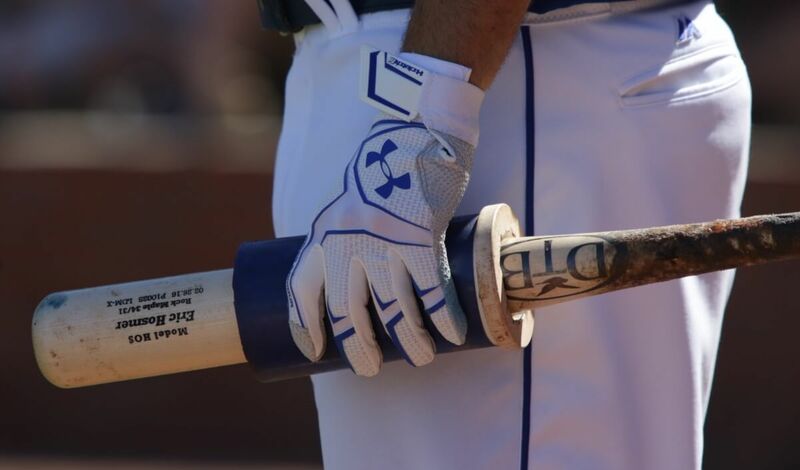 There has been more fragmentation of the market thanks to strong competition from companies like Sam Bat, Victus, and MVP Eric Hosmer’s Dove Tail Bats, among many others. Moral of the story—there’s a lot of good wood out there. Marucci rules again, leading all brands for the 4th consecutive season. This year was a little closer, however, with players like Mookie Betts (Victus Axe), Cargo (B45) and Addison Russell (Zinger) swinging newer brands. In total, 11 10 brands had at least two players swinging their bats, compared to five brands in 2015. Dinger brand made its first appearance at an ASG in the hands of Starling Marte who ripped a línea to right. Despite the stiff competition, the top 3 contenders remain the same. Victus joins Marucci, the reigning champ, Louisville Slugger, the standard, and Old Hickory, a company whose players show as much loyalty to the brand as any other. You’ll notice that Marucci, Slugger, and Old Hick have all taken a slight hit based on the barrage of companies making great bats these days. With three four players this year, Mookie Betts, Jackie Bradley, Odubel Herrera, and Jose Altuve, Victus threatened to matched Old Hickory for the 3rd most bats swung. Also worth mentioning, the prevalence of Lizard Skins grips, used by at least 7 All-Stars that night. Buy those here. Below you’ll find every player and what they swung (if we have the bat in our database, we linked to it). Since Eduardo Nunez played but did not register an at-bat, we looked at what he normally swings, Marucci, and added that to the tally. Its important to keep in mind that this is not a scientific experiment, so if you disagree with the way we keep track, you can always do it yourself. Victus JA27 33/31. From Victus: A custom built model with a flare knob, thin top hand and medium to large size barrel. Generates great bat whip for a 33” model while maintaining solid control.